The tobacco packhouse is one of a cluster of outbuildings situated behind the McCown-Mangum House at West Point on the Eno. Only two of the original work buildings, the tobacco barn and the packhouse, remain as reminders of the intensive farming that once went on at this location. This was the working heart of an extensive layout of crop fields (cotton, tobacco, watermelon), now no longer in existence. These fields were probably in use in the mid-eighteenth century. They were predated by Indian meadows whose existence is attested to by the names of the streams that thread this area—Black Meadow Branch and White Meadow Branch. It is possible that the Packhouse dates from John Cabe McCown’s time as part of the tobacco side of his farming enterprises. Evidence discovered when’ the new tin roof was put on indicates a possible pre-Civil War date to the building. There are clear signs that the original roof was made of oak shingles. Jack Vaughan, who lived at West Point as a child, recalls the Packhouse and its origins. It is perhaps impossible to resolve the question of whether McCown built the Packhouse before 1876 and Mangum kept it up and added to it, or whether Mangum built the entire structure some time after 1891. The curious use to which the Packhouse was put by Mangum’s oldest son Hugh is not so conjectural, however. 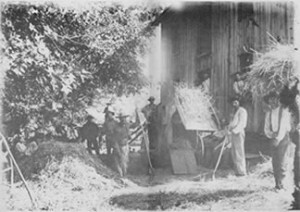 The earliest graphic evidence of the Packhouse is one of Hugh Mangum‘s photographs showing a cluster of farmhands at the north side of the building. Mangum’s primitive dark-room was upstairs in the southeast corner. Even in the later years of his short life, he returned here sporadically from his photographic journeys through the South. After Hugh Mangum‘s death in 1922, the building and its precious store of glass negatives fell into disuse, then into disrepair. Scheduled for demolition in the early 1970’s, it was saved at the last moment by the intercession of the Friends of West Point. The glass negatives were retrieved by the family and given to the Eno River Association for safekeeping until they could be permanently stored at Duke University. The painstaking work of restoration was then begun. Money was found, rocks were gathered; pier by pier and wing by wing, the Packhouse was renovated (with some extra sophistication) to become an extraordinary center of early photography. Special thanks go to members of the Mangum family and to all those individuals, clubs and corporations, visionaries and volunteers who helped put together the Hugh Mangum Museum of Photography.